The nanobugs card collection is a fun way to learn about the bacteria, viruses, and fungi that live all around us but are too small to see except under a microscope (nano means “very, very small”). Through the character cards, learn about 46 microbes that we call “nanobugs” and whether they are helpful to the body or how to prevent them. Kids will love the cartoons and learning their scientific, fun-to-say names. Parents and teachers will love the accurate information on the microbes and how to avoid the ones that cause infection. 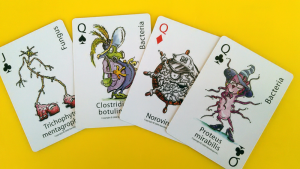 Each 60-card collection contains 46 nanobugs characters (28 bacteria, 15 viruses, and 3 fungi), and 14 informational cards.